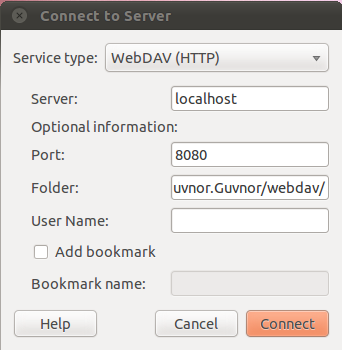 Hi, Could you please try to access Guvnor through WebDav using the methods described by the doc: http://docs.jboss.org/drools/release/5.3.0.Final/drools-guvnor-docs/html/ch09.html#d0e2774? If this works, then its probably a bug or a configuration problem in your ant webdav plugin. Hi Jervis, thanks for the response. I connected in Ubuntu.. If you have configured Guvnor to use authentication other than the default nilAuthenticator.authenticate (in components.xml), you need to configure your webdav client with a valid user name and password. INFO 31-10 07:58:36,151 (NilAuthenticator.java:authenticate:35) All users are guests. INFO 31-10 07:58:36,998 (NilAuthenticator.java:authenticate:35) All users are guests. I think this is a common issue with JBOSS BRMS installations before 5.3. I actually ditched webdav, and got it working by using REST, which is much easier and more stable. Do you want to see some examples? Yes, I asked in Jbpm forum and recommended it. But last issue I am having it from eclipse plugin, and specifically when I deployed (or tried) guvnor in weblogic..